From left: Brig. 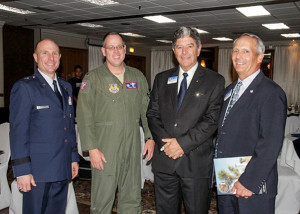 Gen. Carl Schaefer, 412th Test Wing commander, and Col. Charles Webb, U.S. Air Force Test Pilot School commandant, pose for a photo with new Edwards AFB Civ-Mil president John Fergione and former president Michael Belzil. The four participated in the 2015-2016 Civ-Mil installation dinner where new members were introduced. The group has donated over $29,000 to help support Airmen stationed at Edwards AFB this past year. LANCASTER, Calif.–The Edwards AFB Civilian-Military Support Group held its annual installation of officers dinner Oct. 8 at the University of Antelope Valley Ballroom. Brig. 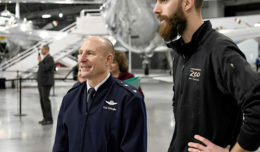 Gen. Carl Schaefer, 412th Test Wing commander, was there to swear in the new officers that will serve for the next year. Civ-Mil’s mission is to support the base and take on annual service projects that benefit Edwards AFB Airmen. 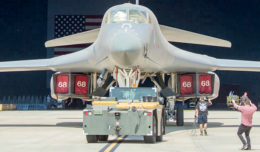 The Edwards AFB Civilian-Military Support Group was first established in 1989 in response to the Base Realignment and Closure Commission’s determination to shut down or realign certain bases all over the country and world. The organization exists to create a friendly association between civic leaders and military personnel at Edwards. Civ-Mil acts as a host group when needed and finds annual service projects to improve the general quality of life on base. This past fiscal year, Civ-Mil raised $29,000 for projects and events dedicated to Edwards AFB.